The Rubik's Cube folks figured out a way to make the simple puzzle even more maddening than before. For Graham Parker, the guy who took 26 years to solve the original, this is bad news. 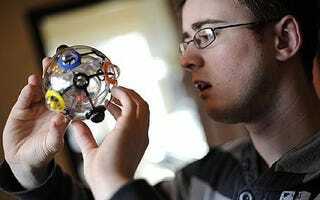 The new puzzle, called Rubik 360, is set for an official unveiling at the German toy industry fair on February 5. Like the original, the premise is simple. It's the execution that's going to cause people to lose 26 years of their lives trying to solve it. Basically, players must get a number of colored balls from a clear inner sphere into their matching slots on the outer sphere. You'll do this by shaking the balls through a middle sphere that has only two holes. Said Professor Rubik himself on the new puzzle that bears his name: "I feel that the 360 is one of the most innovative and exciting puzzles we've developed since the Cube – adopting elements of my original design, challenging the solver to use skill, dexterity and logic."